The Pedalin' Pig marks gluten-free options on their menu- but I advise speaking with the staff about cross contamination and other allergies (as with any restaurant that serves gluten-containing items). I love that they split the sides column with "gluten-free" and "full of gluten." Gluten-free buns are available, but the day I had visited they had run out of them the day before (to my dismay). When I ordered, I let the wait staff know I was an allergy, and they said they would handle my food with fresh gloves to prevent cross contamination. Note that fried items are made in a shared fryer- my waitress said that the complementary hush puppies that came to our table when we sat down were safe, when in fact they were fried in a shared fryer. To see the other page of the menu, click here. My picture was a tad too blurry to post. 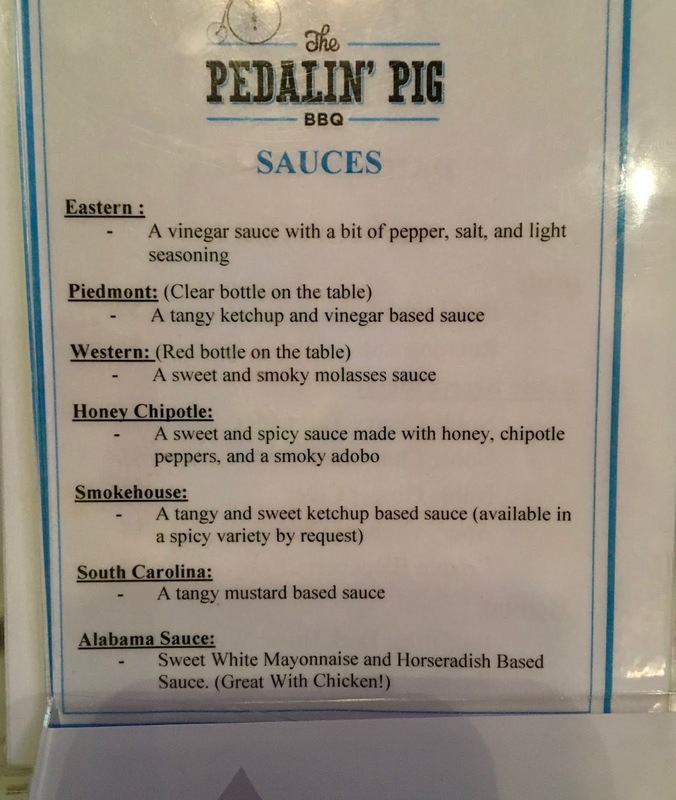 All of Pedalin' Pig's sauces are gluten-free, I opted to try the two options on the table (Piedmont and Western). Be sure to about other ingredients in the sauces if you have other dietary restrictions. 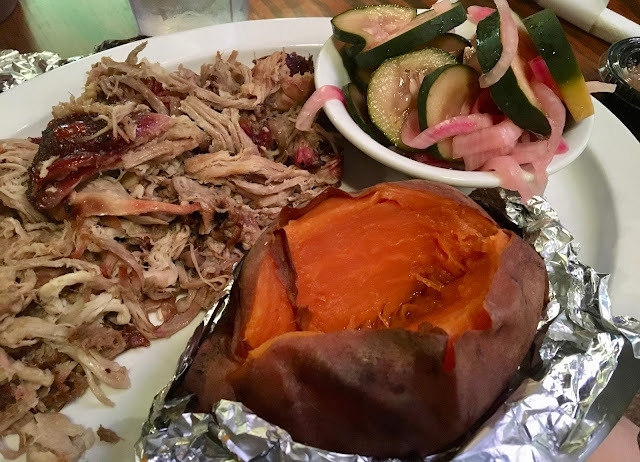 I ordered the half-pound platter of pulled pork, and chose the baked sweet potato and marinated cucumber and onion for my sides. I don't normally eat pork, but made an exception for Pedalin' Pig's because I was craving the pulled texture, and used to enjoy pulled pork before I developed food sensitivities. The pork is tantalizingly tender, succulent and flavorful. It's not too fatty (as some pork can be), and I loved dressing it with the tangy, robust Piedmont sauce (a ketchup-vinegar concoction). The portioning of the pork is quite generous, I took half it home as leftovers and made pulled pork sliders the next day. The marinated cucumbers and onion made me pucker at my first forkful because the vinegar flavor is sharp. Tart and sweet, I adjusted quickly to the side, and liked the crisp veggies with their flavorful marinade. The sweet potato was baked to soft perfection- made even better with a side of brown sugar for a sprinkle of sweetness. I enjoyed eating the skin of the potato, and the delicious orange flesh of the potato. My meal was filling and oh, so good. It definitely scratched the barbecue itch that I get when there's so few barbecue options in D.C. and Maryland. 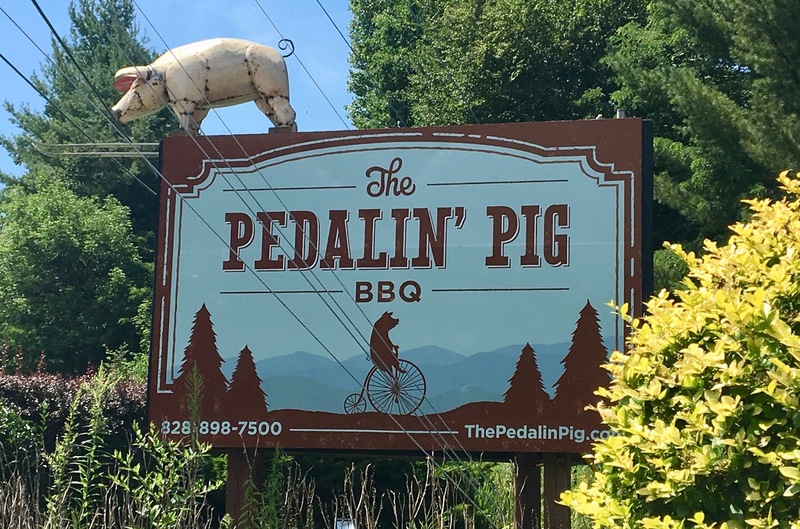 Plus, with a scenic view of the mountains, it checks all the boxes for a perfect barbecue-eating experience. I hope to make my way back here soon, and will dream of this pulled pork for quite a while.